The work that I do involves training U.S. soldiers on three different parachutes. At work, one of our guys was teasing me about the fact that I didn’t jump. He convinced me to go to the drop-zone and jump with him. I finally took him up on his challenge in March 2017, and I went down to Virginia Skydiving Center. The guy I mentioned is an examiner for the United States Parachute Association (USPA). I went up with him and another instructor and made my first Accelerated Free-Fall (AFF) jump. I was kind of nervous; it had been a long time since I was up at altitude—not since my Army jumpmaster days. The greenlight came on and the door went up. I said my prayers. Suddenly, it felt like I was back in Jumpmaster. I went out the door and was immediately hooked. I was so excited. It takes 25 jumps to complete the requirements to earn your skydiving license. Between my first and 25th jump, I hurt myself on the landing. I flared too late and tore ligaments on both feet. I was out for a good 2-3 months; but as soon as I healed I went back in the air! It was funny because when I hit the ground I knew right away that I was hurt. I think I still have that airborne infantry mentality which is, ‘if I can walk off the drop-zone then let me walk.’ So I did. Later, when I pulled off my shoes, my feet swelled up immediately. 2) What was it like to jump round parachutes in the Army? When I first came in the Army we were jumping the -10. They aren’t steerable; you have to do slips and riser turns. Then we went to the -1 which has toggles. If you give a soldier toggles that’s considered more of a high performance canopy—and that can be dangerous! For example, the MC-6 does 10 knots on a normal descent. Now imagine the wind is running at the maximum jumpable speed of 12 kts. If you’re running with the wind that’s 10+12 kts = 22 kts. That’s cooking. Soldiers run with the wind and end up hurting themselves. So, training is pretty important. I have 408 jumps on round canopies. I was a Jumpmaster and assigned to Ft. Bragg, North Carolina for 10 years followed by Ft. Benning, Georgia. The requirement for attending Advanced Airborne School in order to become a Jumpmaster was 35 jumps at the time. I went in 1992. I failed three times before I passed. Nomenclature was tricky and I suffered through it. My last jump in the Army was at Ft. Benning out of a C-130 into Fryar Drop-zone. We were jumping from around 1200 ft. I was the first person in the door. That was my favorite jump, and the most momentous of all of my 408 static line parachute jumps while I was in the Army. 3) Did you have any jump injuries while you were at Ft. Bragg? I was coming in for landing on a night jump on Sicily DZ. I lowered my rucksack but was unable to lower my weapons case. I fractured my right leg on landing and I was in a cast for six weeks. 4) How many jumps do you have? I have 127 skydives; I did a ‘hop-n-pop’, or a low altitude jump for my 100th skydive. It was low-key because I was at a different drop-zone that I wasn’t familiar with. I was more excited when I hit my 100th jump in round canopies. I just enjoy jumping. I could make one jump, or five jumps in a day and I’m still happy. I got into the sport late but I’m enjoying it so much. 5) How long were you in the military? What kind of jumping did you do in the military? I graduated high school on June 27th 1982 and I entered active duty in July 1982. I enlisted. I did Marine Corps ROTC in high school and my goal was to join the Marine Corps as a recon ranger. But the Marine Corps didn’t guarantee a MOS at the time so I joined the Army. I knew right away that I wanted to jump out of airplanes—and that I wanted to be infantry. As long as I could remember, I always wanted to be in the military. There was something in me that wanted to do that: wear the uniform; learn to shoot a weapon. At the time that I came of age, the Vietnam era was ending. On my dad’s side of the family, all of the men were in the military back in the Dominican Republic. That influenced me. I felt like it was in the blood. I graduated Airborne School in October 1982. After graduation, I went directly to Ranger School. I had enlisted in a special program for recruits that guaranteed MOS and schools. After I graduated from Ranger School, I went to Ft. Bragg, North Carolina and was assigned to the 82nd Airborne Division. I spent my first ten years at Bragg. Then I went to Ft. Benning, Georgia followed by a tour in South Korea before returning to Benning. I spent time on the trail, then served as a scout platoon sergeant in 3rd Infantry Division before I retired in 2002. When I retired I was a First Sergeant at the training battalion on Sand Hill. 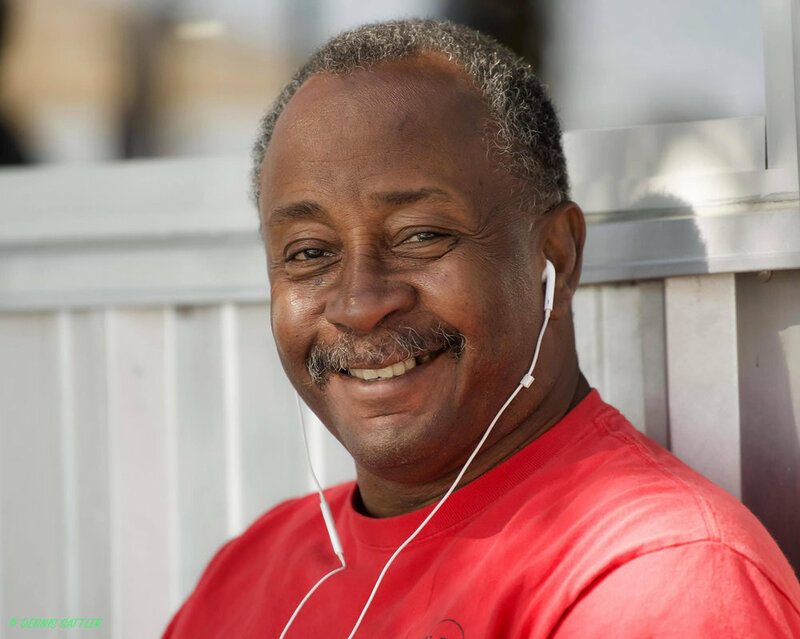 Mike came from a family that spent time together in the outdoors and he raised his children to feel the same. Photo courtesy of Mike L.
6) What types of outdoor activities did you do with your family while you were growing up? We played baseball. My father grew up playing baseball and it’s something we would do when we were kids growing up in Yonkers, New York. I played catcher and second base. There were four of us, three boys and one girl and I am the oldest. My parents are from the Dominican Republic which makes me first generation Dominican-American. My dad was a harbor pilot in the DR until the late 1950s but he also played baseball and that’s how he migrated here to the states. My kids have always been in the outdoors with me. I took them hunting and fishing. They played all kinds of sports: football and baseball. They’ve been all over and seen everything. 7) What does your family think of your decision to start skydiving?? My nephews and my kids know that I love extreme sports. They appreciate what I do. My wife worries but she knows that I’ve trained my entire life for jumping out of airplanes. Would she like me to continue? Probably not, but she supports me even though she’s not going to go watch me jump. I don’t jump every weekend; I also like to spend a lot of time with my grandbaby who is 16 months old and lives in North Carolina. Maybe when she’s older I’ll bring her out to the drop-zone. 8) What container and parachute are you currently jumping? What was your progression? I have a 220 Navigator and a Javelin container that I got it from a friend of mine. I call it my Cadillac—soft opening and soft landings. 9) What type of skydiving do you enjoy? I really like formation skydiving. You fly with a bunch of friends; you’re having a good time; all of you are trying to get as many points before it’s time to track away. I like watching people’s faces. I haven’t done any radical stuff in the air other than tracking. 10) What was your most memorable skydive? Do you have a favorite? I really don’t, I just enjoy every skydive. When I’m getting ready to jump I think about ‘the Queen’, Carol Clay. 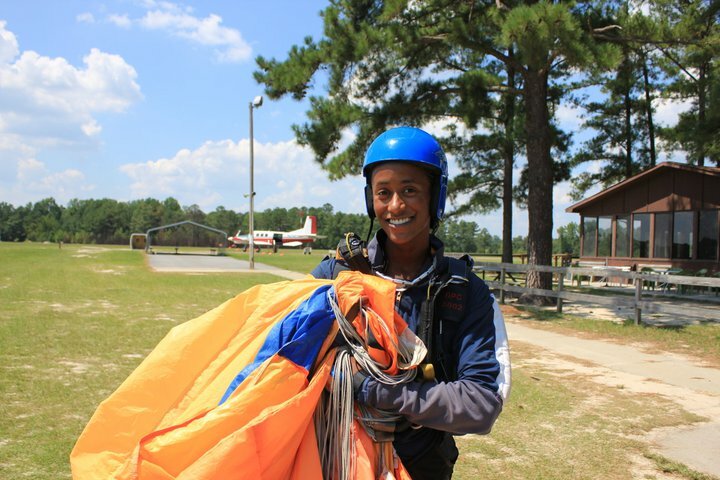 She was a well-known jumper from Virginia Skydiving Center who recently passed away in May 2018 due to a skydiving accident. She was 69. ‘The Queen’ saw me coming and going when I was still learning and working on my license. She was always friendly and when I got licensed she told me to “go get your gear and let’s jump.” It was pretty exciting to know I was jumping with a woman who had 20,000 jumps. I was making a jump—I don’t remember which number, and I was doing a hop-n-pop from the King Air. We were on jump run. The red light came on, the door opened and I leaned out of the plane to look for the spot. ‘The Queen’ was sitting behind Steve, a fireman from Richmond. The visor of my skydiving helmet was closed against the prop blast. I was holding onto the bar over the door, bracing myself as I scanned the sky below for aircraft. I was looking out and looking in, waiting for the green light as I listened for the coming drop in airspeed and felt for the ‘lifting’ sensation that signals flaps are being lowered. All of those signs together meant it was time to jump. Then the left engine blew. Two more things happened simultaneously: the pilot put the plane into a steep dive and he brought the flaps back up. Steve grabbed me by the chest strap to pull me back inside the plane. So now I was sitting there with Steve holding on me while I held onto the bar. Finally, the pilot leveled the plane off. I looked back towards the front of the plane and the Queen had the biggest smile on her face. It was reassuring. The pilot yelled at me to sit down. Meanwhile, my visor was still closed. They knew I was ready to get out of this plane. However, the pilot, being a skilled airman, landed the plane safely. That was the last time we jumped the King Air. In 1997 there was a big plane crash in West Point, Virginia where nine skydivers died. ‘The Queen’ was there but she wasn’t on the load. So when I think of this moment, I think of the Queen—of what it must have taken to stay calm in a moment like that. And how her smile encouraged me not to worry. What appeals to me, other than the rush, are my friends that I’ve made in the community. My drop-zone is small enough that we feel like family. We’d barbeque. At the end of the day we’d do a sunset load, grab a beer. 10) What is the most challenging thing about skydiving? Dealing with the unknown—especially that moment when the engine blew. I was in the military and we always have emergency procedures and courses of action. As far as challenging in other ways, I’ve had two brake-fires that put my canopy into a spiral. And I had my injury but so far no cutaways. Skydiving to me is about spending time with people who like the same thing you do; especially with our group being minority skydivers and all of us being connected. 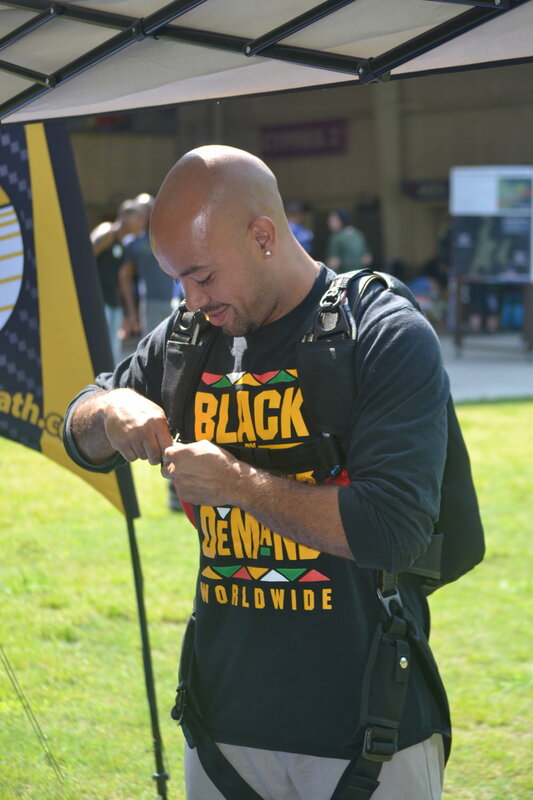 Being able to show up as a group and show others that Black aint scared of jumping out of the airplanes is powerful. To know our history. To know that 555th Parachute Infantry Battalion, “Triple Nickle” was the first all Black airborne unit that tested parachutes for the Army. That they later became the first smoke jumpers in the United States and developed a technique called ‘hooking’ in order to purposefully land in trees on dangerous mountainous terrain. It’s about knowing our history and feeling connected; I also enjoy the friendship along with the rush.